Technical Analysis and Elliott Wave Theory: First target hit! Last friday, the market hit my first target for Primary [B] @ 1014. Thus it's possible that we'll see the very first waves of Primary [C] next week. But at the moment it's too early to call a top. It's very likely that the market will turn around 950 and head for the 50% retracement @ 1120 later this year. I expected the market to confirm the correction last Monday. That didn't happen; actually even worse: the market surpassed the recent high and hit the 38% retracement at 1014 on Friday. The supposed Ending Diagonal I mentioned during the week didn't work out as I'd hoped and could now morph into a Leading Diagnoal. In this very bullish count I would relabel green [iii] to blue A and green [iv] to blue B. 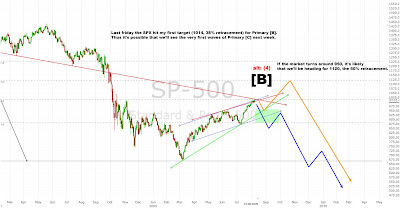 Hence the B wave correction, everybody is waiting for, would already be over! 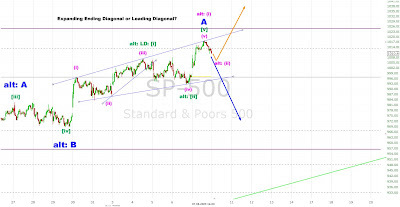 The other possibility is that we saw a rare Expanding Ending Diagonal. A drop below 992 should confirm it.